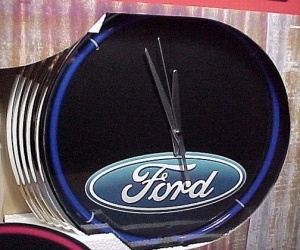 Striking Collectible Automotive Advertiser with the Blue Oval Logo on Black, Fun for Bar or Family Room Decor. Chrome bezel molded plastic case, bright blue neon ring, high gloss, clear plastic face, aluminum hands, accurate quartz clock movement. UL listed AC adapter is included. Requires AA batteries for the Clock (not included) and a 120V AC outlet for the Neon. Measures 15 inches W and 2 1/2 inches deep.